Travel plans are exciting and once they are made, begins the anticipation for your journey to begin. But with every trip comes a phase of sitting down and making a list of things you need to carry. As much as we all enjoy travelling, packing for a trip is always a task, if you are among the forgetful ones. Many a time, you pack everything but leave out something important and it completely misses your mind in the excitement of the trip. There are certain travel essentials that must be a part of your travel backpack. If you have a dedicated travel bag, then these are the things which you should not really unpack, because you are definitely going to need them the next time. Let us help you out with a must-have list of travel essentials, that you need to carry everywhere, regardless of the duration or the destination. 5 Travel Fashion Accessories to Make a Style Statement on The Go. Packing a travel bag is much more than just filling clothes in your bag. Other than your daily hygiene kit and personal care products, there are some things which need, more for safety reasons and unexpected moments. 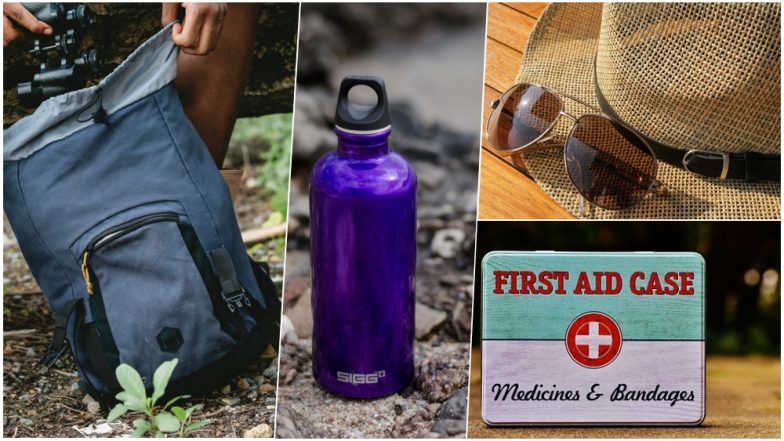 You may be travelling with your friends, family or even solo tripping, your backpack will be incomplete without these things to carry. Skin wipes and tissue papers: We all tend to carry napkins, handkerchief along with our clothes, but skin wipes are a convenient option. The fragrant ones help you to feel fresh if the weather is too sweaty. Always carry a packet of tissue paper along with you. They won't add any burden but can be used in numerous ways. Portable charger: At a time when we are constantly hooked on our smartphones, be it for information or finding ways, having a battery backup is essential. Always carry a fully-charged portable charger along with you. If you are a frequent traveller, we would advise you to get a separate charger which you can just keep for your travel. Torch or headlamp: Although all phones today have the flash option, it is better if you carry a torch, one with a long range. You cannot always be dependent on phone light for your journeys. A torch is convenient and a better option to look for the way at night. If you want your hands to be free, then you can get a headtorch as well. Good quality water bottle: Water is accessible at most tourist places but it is best to have your own water bottle. Instead of the plastic bottles, get yourself a good quality water bottle which you can carry everywhere. First aid kit: Keep a first-aid kit of yourself ready for all your travels. Keep it stacked well with painkillers, bandaids, your regular medicines (if any) and bandages. One can never really predict what happens on the journey. But instead of relying on someone else, make sure you are well-equipped to cover yourself in case of minor injury or health issue. It can also help others around in need, in any case of emergency. Sunglasses: Whatever the weather you are travelling in, it is okay to own a good pair of sunglasses. Sunglasses need not just protect you from the sun, but also in case of winds. So get a good pair of sunglasses which cover your complete eye. Extra durable bag: Always carry an extra pair of a foldable bag within your backpack. You may not use it at all, but it can help in case your luggage increases or keep your wet clothes, shoes or anything else. It is always better to have an extra bag rather than looking for someone to lend from. Body creams: Although creams will come in your personal care kit, we mean all kinds of creams that you must travel with at all times. A sunscreen, body moisturizer, vaseline or an insect repellent, make sure you have all the body creams. Depending on the kind of your skin, carry all the necessary body creams. These are some of the items that you just cannot travel without. So if you have a dedicated travel bag, make sure you keep these items packed in advance. Keep the above checklist of travel essentials handy, the next time you sit for packing your bags.